Starting point guard for your New York Knicks, number 17, Jeremy Lin! These are words that if a month ago you told Jeremy Lin he would hear them at Madison Square Garden, he would have probably laughed and said you’re insane. Jeremy Lin is the ultimate underdog story, a real David vs. Goliath. He has gone from the NBA’s developmental league to starting for the New York Knicks and in the process has taken the basketball world by storm. With his electrifying play, undeniable instinct and knowledge for the game, he has earned the nickname “Linsanity”, and won the hearts of millions around the world. The amazing thing is, about a month ago nobody even knew who he was. It would have been nearly impossible to predict that Lin would ever experience the success he is currently enduring. So, let’s dissect and analyze how it all happened. He played his college ball at the University of Harvard having not received any scholarships to a major basketball school. Harvard, being a school that has never produced any notable players, is a place where hopes of making the NBA typically die faster than the time it took President Barack Obama to win a debate on that very campus. You would think it to be mystifying that the all-state senior captain of a 32-1 Palo Alto high school team could go un-noticed going into college. But coaches and scouts said he was weak and too small. Still, Lin kept his head up and though it was a slow start at Harvard, he was turning heads(those who were watching) and “breaking ankles” in the Ivy League by his junior year. He made all-conference Ivy League two years in a row, and graduating with a degree in economics. Lin, having not been drafted in the 2010 NBA draft, would do various work-outs with different teams only to be turned down time after time. However, Don Nelson(General Manager for the Dallas Mavericks) saw something in Lin that nobody else saw. Now, Nelson sitting atop the career wins list for coaches in the history of the NBA has always had the reputation of thinking “outside the box”. He examined Lin on the court and offered him a spot on the summer league team. Lin played well enough to receive offers from multiple teams including the Golden State Warriors. He ended up signing a two year deal with the Warriors. It seemed to be a perfect situation for Lin, being back in his hometown and playing for his favorite childhood team. Here’s were it gets interesting. Being that he is the first Asian-American to play in the NBA, and given the large Asian population in Bay Area, not to mention he is from the Bay Area himself, he became an instant fan favorite and cult hero. Granted he was backing up Monte Ellis, and Stephen Curry. Fans would chant his name as he was sitting on the bench, encouraging the coach to put him in the game. The fans did not get their wish more often than not, and Lin would find next to no playing time. He was later sent to the NBA’s developmental league and later released by the Warriors. Coaches around the league thought little of his skill, and considered him a “minimum asset”. Nobody seemed to think he was going to be much more than a temporary roster filler, let alone a superstar. Lin continued to work, adding muscle and weight with grueling work-outs day in and day out. He would be claimed off waivers by the Houston Rockets and played just two preseason games before being released once again. On December 27 2011, he was signed by the only team that even slightly believed in him, that’s right… the New York Knickerbockers. Now, let’s fast-forward to February 3 2012. The injury ridden Knicks, who were in a horrible slump at the time having lost 11 of its last 13 games were in desperate need of help at the point guard position. 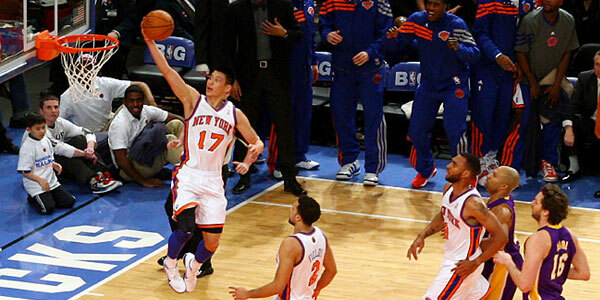 Here’s where the whole Linsanity thing kind of exploded onto your television screen. On the 4th of February the Knicks played the New Jersey Nets. This is probably a game that Jeremy Lin will never forget. Let’s not forget ourselves, Lin was only playing in this game out of “desperation” due to injuries, and pathetic team performance. Anyhow, he outplayed everyone on the floor scoring 25 points, dishing 7 assists, and grabbing 5 rebounds setting career highs across the board. Needless to say this was by far Lin’s biggest game to date. It was the game he had been waiting his whole life to play, and finally got a chance to show everybody that he is much more than a “minimum asset”. It was, in other words, the perfect storm. Jeremy Lin’s scintillating play has tremendously helped revitalize the Knicks’ current season, and brought them to a 10-3 record since he has been inserted into the starting line-up, including an impressive 7 game winning streak. He shows incredible rhythm on the floor similar to a Steve Nash or Chris Paul. He makes his teammates better by creating the right situations and distributing the ball to the right person at the right time. The only knock against him is that he is perhaps over-aggressive at times. Keep in mind that this is technically only his first full season in the NBA. As a Knicks and basketball fan in general, I believe from watching him play and analyzing his every move, he will eventually learn to be more careful with the ball, thus limiting the turn-overs. He will also learn to distribute more than shooting the ball which will add assists to his stats and take away the points. 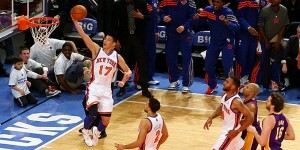 Jeremy Lin has become a cult hero in New York City, and in affect has lead to becoming a worldwide phenomenon. He has kids routing for him in Dongguan,China where he had a brief stint on the Dongguan Leopards last year. It’s not often this type of story materializes in sports, or anywhere. Everybody loves an underdog story. I love writing about the underdog because they are completely unscripted, a diamond in the rough so to speak. If stories like Jeremy Lin didn’t exist, everything would be scripted and boring. What more can you say about the guy. He saved the Knicks season, and really made people forget the fact that just a few months ago the NBA was in a lockout and had a slim chance of even producing a 2012.